Alex J. Cavanaugh: Double Tips! For those of you participating in the Challenge, I hope you’re following all of the hosts - Arlee Bird, Talli Roland, Jennifer Daiker, Candace Ganger, Karen Gowen, Jeffrey Beesler, Stephen Tremp, and me. From now until April, we’re all offering tips. As the numbers swell, you might be wondering – how on earth will I visit all of those blogs in a day? The answer? You can’t! Not even Captain Ninja Alex can master that feat. Can you visit about a dozen a day? That’s what this Challenge is all about – finding new blogger friends. Explore the list on a daily basis and visit a handful of the bloggers. Even with eight co-hosts, we can’t possibly visit every blog every day – which is why we are counting on YOU, the participants, to visit one another! Fantastic Friday Writers – Research Tip! I invite your to check out my Fantastic Friday Writers partners - Elizabeth Mueller, Anastasia V. Pergakis, J. D. Brown, and Deirdra Eden Coppel - for their take on this subject. I’m sure it’s better than mine! Since research is such a broad subject, I decided to focus on the research I conducted for my book’s space fighters. And I’ll make it simple for you! Go with fact –Military fighter jets most closely resemble my book’s Cosbolts. I researched plane design and flight, and even spoke to some fighter pilots. I wanted to convey the proper feel of flight and use the correct lingo. Go with speculation – Since real space fighters don’t exist, I turned to the next best thing – science fiction movies and TV shows. Anything that showed fighters in action! I needed a good sense of movement, firepower, and the craft’s capabilities. Between fact and speculation, I came up with the look, feel, and movement of my Cosbolts! Anyone else use both fact and speculation? And who’s ready for a good science fiction movie now??? Oooh... I am already following 465 blogs and can't reach all of them every time they post. My record of hits is about 280 in a day. Took forever, because I tailored my comments. So theoretically, I can do it once. Maybe for a week. I'm aiming for about 20 new visits a day. Keeping it all for fun rather than stressing over it. I finally got around to ordering CassaStar. Should be here soon! For one of my projects I needed to learn about the Royal Navy in 1811. Did a whole lot of research on the internet but then got Master and Commander, the book and the movie just to get a 'real feel' for life on a boat during war time. Helps tremendously. I even know the difference between a bo'sun and a coxswain now. To read everyone's blog everyday for a month, in the words of the Perry Como song "It's Impossible". I'm ready for the next Firefly movie - as soon as they decide to make one! Fact or speculation? Like you, I go for a little of both, leaning heavier on the speculation side of things. A dozen a day sounds reasonable, and I'm relieved to hear you suggest it! As for fact and speculation, I use both when I set my books in the future. I think it makes everything seem more real. Speculation is more fun, isn't it? Ha! I posted on research today, too! I like your take on it. maybe I could take the role of a professional visitor of blogs, that way people could hire me (and pay me) to visit AZ blogs instead of them :))) Imagine the money I'd earn :) Maybe I should open an agency for this? What do you mean real space fighters don't exist? THat's not what I heard! Or are you just turning a blind eye to the Borg around us? Misha, you're good! I think 160 is my tops. Matthew, thanks - that's awesome! Anne, you understand my research methods! Milo, movie or new series - I'll take either! Alison, a dozen is easy. Thanks, Elizabeth. Yours of course is better. which movies and TV shows did you use. The designs used in B5 were actually adopted by NASA. Alex- I do believe I am following each one of the hosts :) I can't wait for the A-Z challenge- its going to rock! Oh you A-Z blogfesting people are blogifabulous!!!! Well, my cheerleader outfit is all set and ready to be worn for April as I shake my big pompoms at all my yummy bloggie friends participating!!! Yay!!!! Ooooh I knew there was a reason why I felt as if I were truly flying with Byron and Bassa. Fun times...! I love hearing how authors research for their books. I'm writing a fantasy, and I use a lot of the same lingo, terms etc that a lot of traditional YA fantasy uses. My research is reading as much "classic" ya fantasy- you know, the medeival type attire and time period, magic, the "journey" or "quest". A lot of the staples of the genre appear in a lot of the books I read. "And who’s ready for a good science fiction movie now???" And tanks for the tips, dude! Well, for my novel, the Flettleglag Force, I used a combination of real life knowledge about fast food and my affinity and insight into super heroes for a combination du force. 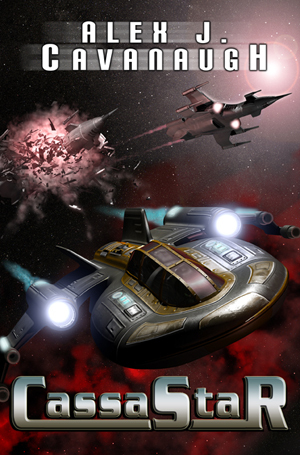 Budd, I was probably closer in design to Battlestar Galactica. Jules, now that's an idea! Summer, MegaMind came out today! Kitty, will Charlie be in an outfit as well? Because if so, we want pictures. Jeffrey, and that shall make for such a unique combination! Yes, I mix fact and speculation. But I've never created anything for space. Hm. It's hard to speculate, really, for me because I'm always worried someone who does know will call me out! That's when I wish I wrote sci-fi! You have got me in the mood for some science fiction! I think I'll see what's on the syfy channel. Hope we're driving home the message that no one is expected to visit every blog every day in the A to Z Challenge. Part of the Challenge is learning to be selective and to spread oneself out over a period of time. I'm interested in The Battle of Los Angeles--but I'm going to wait til it comes on DVD. My books are reality based, so I had to go mostly with the facts. My first novel had fantasy elements. WIth all the fantasy I read in the past helped but I also researched about the actual elementals. I needed to accurate with those facts. I love your researching tips! I especially like speculating!!! Thanks for the tips, Captain! I use fact and speculation when writing about wormholes opening and closing. Since red, yellow, and orange are generally considered the colors of energy, I use yellow and orange to describe the colors of a wormhole. This is opposed to the warm colors like blue that Sliders used in the TV series. And I wanted something different. I have the characters close blinds and shades when opening a wormhole in the case someone walks by they will not see the bright flash of light, or the may notice a fraction of the light that might give the impression the TV is on behind the shades. My dystopian combines fact and speculation. My current WIP, which is fantasy, is set in an actual place and I had to do a lot of research on spots that I wasn't exactly familiar with. I had family willing to hike where I hadn't been and take pictures so I could be more specific! And I'm totally ready for a good science fiction movie!!! NOW! This will be an interesting challenge. I just did research on alternate power sources for my current WIP. I love the mix of Fact and Speculation! I would actually love to try my hand at a sci-fi novel someday... And I think we're due for another great sci-fi movie, too. I keep thinking there should be another Trek series on tv, also...it seems weird that there isn't one. I've definitely used speculation as a reference, so to speak. Sometimes it's all you've got for sci-fi! I'm thinking the challenge may be fun, but I'm going to see if I can think of a few post ideas before I join. I love the idea of an A-Z challenge though. thanks for the tips. Talli, always time to genre hop! Oh Jai, nothing good I'm sure! Stephen, that's some serious details. Jennie, you have an awesome family. Donea, hold on for this weekend's post - might be another great science fiction film coming. Paul, all you can do make the effort to visit some. And yes, I'll go through fifty blogs in Google Reader, only to realize my daily buddies have just posted fifty more! I use both. I think it add to the realism in a "fake" world. Fact + speculation = a good, user friendly formula. Thanks Alex. Hey--double dipping is a STRATEGY to get everyone else to walk AWAY from the dip! Great tips, Alex! Yes, I use both. I found a theory for artificial gravity generators and a man working on making them reality. I speculate they will be a reality. I also used stealth technology to camouflage to turn things invisible and use articles from NASA and science rags to project technologies which sound cool. Cool dips.. I mean tips! Can't wait. Happy weekend to you, Robyn! M Pax, I knew you'd be on top of the facts. I may not be participating, but I will be looking at posts! Always in the mood for a sci-fi movie! Have a good weekend Alex. I'm not sure I know how many blogs I follow. I know I don't get to them half as often as I want to--hence this is the first I've read of the challenge. I like your research tips--research that works and doesn't sound like research. Definitely fact and speculation, with a heavy bias towards the latter. And a dose of healthy extrapolation for good measure. For example, my interstellar drive uses the well-worn concept of hopping through higher dimensions, except mine are millions of small hops a second. The killer is that if you push the drive too hard you introduce cumulative nano-scale translation errors along the way leading to sickness and equipment damage. Blegh! I'm going for at least 2 dozen per day. It will be softball season by then and I'll be spending a few prime online hours out of range some days. I'll also try to catch up on Sundays. I love a writer that does his homework! At this rate, you will double me in no time. I might have to participate just to keep within 200. I found an Amazon forum full of people just starting to blog and looking for ways to build readership. Guess what I suggested. At least one of them responded. Scott. I researched the "evil eye," and learned that almost every culture has a belief in this legend, including some Amazon river natives in South America. Take what works and invent a new legend and you have something powerful to wrap fear into your characters. Even if it is short lived. I'm reaching for my copies of Aliens and Starship Troopers! 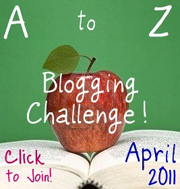 You are right about the A to Z Challenge. I did some maths and calculated that if there 300 participants and you spent five minutes on each blog, you'd need 25 hours a day to visit every blog! I have been hearing so much about this blogfest. All the best, I will be cheering you all. Sheila, you should join the challenge! Botanist, you know your details as well. Susan, you know how many I intend to hit per day. Elizabeth, thank you! Really hope you enjoy it. Promise it won't tax your brain. Ellie, just don't sleep! Wow, that is a lot of time. Rachna, you should join us. I recently wrote a futuristic one. My kids wanted to know why the MC didn't know what ice cream was. Thanks to all my weird knowledge, I know that ice cream took a lot of work to make by hand, cows with cream... in a world without power or cows, well, they wouldn't have any. My kids were horrified, by this leap. Fun stuff. Just goes to show everything we know can help us write what we don't. Hi, popped over from "Tossing it Out", I thought I say hello, great to meet you! Looking forward to taking part in the challenge next month.